The other day I noticed a new billboard in my neighborhood. 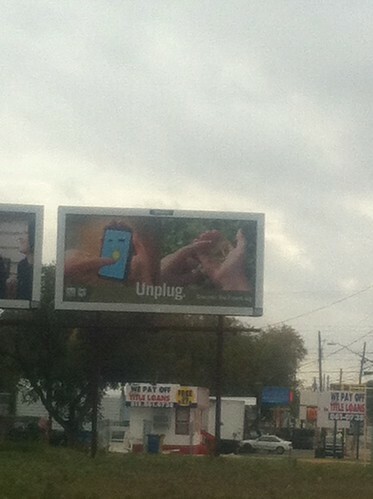 The billboard has two images: the user's eye view of an actual smartphone game, and a picture of a youthful hand holding a digitally inserted tree frog. The message: "Unplug." Brought to you by DiscoverTheForest.org, a service from the U.S. Forest Service designed to help you and your kids find natural areas to discover right in your own backyard (or even "Take a Virtual Hike!"). As it happens, the billboard rises up from an empty lot between an old overpass and some light industrial uses. When I went back to take a closer look on a Monday morning, I noticed a sleeveless urban forager walking the lot, collecting fallen pecans into a plastic bag, preparing for Thanksgiving. And couldn't help but think that his collection of edible nuts was a lot more real than the idea of nature embodied in the sign's imaginary tree frog. The idea that nature is a separate thing from the place we live, partitioned into little animal and plant reservations that you need to look up on the map, is a pernicious one that explains why the Forest Service thinks it needs to teach parents how to find it. 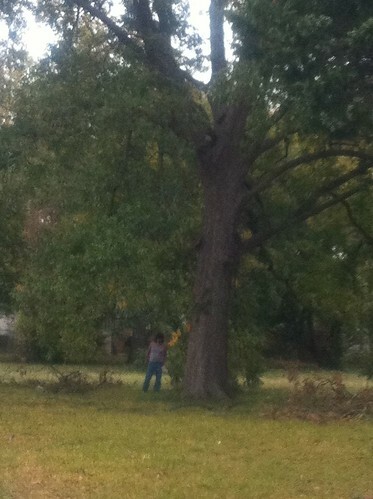 Chances are the kids, like the pecan forager, already know where to find it—wherever they are. At approximately 1700 hours this date 10/18/11 I was dispatched to 210 Kopchak Rd. Zanesville, Ohio 43701 to investigate the report of a lion in the back yard of that residence. Upon arrival at the TERRY THOMPSON residence which is immediately north of 310 Kopchak Rd. I noticed that there were several wild animals running around inside the fence of the Thompson residence. There was a Black Bear and at least two African lions. I made several attempts to contact Thompson by telephone and was unable to find anyone. A short time later LT. RINE of the State Highway Patrol arrived. At that point Lt. Rine and I decided to shut down Kopchak Rd. He dispatched one of his units to the intersection of US 40 and Kopchak and I had another unit II do not recall who) go to Ridge Rd. and Kopchak Rd. Sometime during all of this two of the deputies assigned to my shift discharged their weapons. A wolf who had gotten outside the fence was shot and killed as well as a Black Bear. The gate to the Thompson residence was locked. An employee of FRED POLKs lifted the gate up from the pin where it was allowing me to drive up to the residence to attempt to contact Thompson. When I got up to the residence I noticed that there were several more animals running loose including several lions, a mountain lion, a tiger, and more Black Bears. It appeared as if the doors of the pens were opened. I parked outside of the Thompson residence and sounded my horn but got no response. I then drove back to the outside of the gate. A few minutes later a male who identified himself as an employee of the Thompsons arrived. This was later identified as JOHN MOORE. Moore told me that Thompson should be at the residence. At this point I became concerned for Thompson's welfare. Moore drove with me back up to the house. We did enter the house and searched the inside of the house but were unable to find anyone in there. There were two monkeys and a small dog. On the way out the driveway Moore looked and stated that he thought he saw someone lying just over an embankment near the barn. I stopped and looked. It did appear to be the dead body of a person. Due to the fact that there was a white tiger near the body which appeared to be eating the body I did not approach to try to identify it or see if the person was still alive. I then drove down to the gate where I spoke with CAPT. LECOCQ and SHERIFF LUTZ. By this time several members of the Special Response Team with automatic weapons had arrived. At Sheriff Lutz's request I drove DEP. TODD KANAVEL's personal vehicle which is a pickup truck with several other deputies with automatic weapons up to near the house. I drove around while they shot numerous wild animals. Psychogeography teaches us how to discover the secrets hiding in plain sight within our urban environment, but it is rare to find those modes of access to our physical space applied to discover the pockets of wild nature that abound amid human development—to say nothing of discovery of the idea that our human milieu is itself part of nature—every house and yard a node in the ecological network of the planet. I have written about my own efforts in that regard earlier on this site. And this year I have been discovering the rich trove of English writers who have explored the topic in much more depth—albeit while professing to be anything but psychogeographers. This spring the poets Paul Farley and Michael Symmons Roberts published Edgelands. Subtitled "Journeys Into England's True Wilderness, the book is a celebration of places that the title term was invented by the geographer Marion Shoard to describe—places where wild nature and human development bump right into each other. A deep annotation of the ways in which the imminent ruins of the late industrial revolution, the corporate office parks that replace the forest, the woodlands full of trash and concrete rubble, the grasslands dotted with abandoned shipping containers and living room furniture, all merit lyrical exploration and celebration. Farley and Roberts access the edgelands with the eyes of the boys they once were in rusty industrial suburbs, retaining their youthful capacity to explore the most remote edges of the city with an intuition for wild wonder. The Unofficial Countryside is a proper reckoning, the Domesday Book of a topography too fascinating to be left alone. Gravel beds, abandoned by film studios, were blissfully repossessed by passerine birds and opportunist plants. Mabey logs the tough fecundity of the margin, where wild nature spurns the advertised reservation and obliterates the laminated notice-boards of sanctioned history. Human tragedies of our paranoid cultures, raids and terrorist outrages, as Mabey points out, are nature's opportunity. "The first summer after the blitz there were rosebays flowering on over three-quarters of the bombed sites in London, defiant sparks of life amongst the desolation." I have not yet found any American analog to this English library of the edgelands. The closest thing is probably the urban exploration scene, which focuses on abandoned buildings rather than neglected landscapes. Perhaps this is because our big colonized continent still has so many verdant areas largely free from human encroachment, like Mark Trail's magic valley, where we experience palpable virginal biodiversity. Those places will always exist, though often under examination they reveal themselves to be incubated by human curation—more sophisticated connoisseur variations on the Zanesville exotic animal park. Edgelands are a more realistic template for future nature than Avatar, and by exploring them and better appreciating how our habitat is fully integrated with that of other species, we can amplify that integration and make it more harmonious. As the provocateurs at the new group blog Next Nature are documenting so well, the conditions of the 21st century compel us to confront nature from the part of it we cause. If we can see the planet as a giant imminent edgeland, we might be able to do a better job sharing it with our fellow occupants—and better perceive the quotidian wonder we drive by every day, and have the power cultivate and enhance.